Fiddlers Green… the band that invented their own genre- ‘Irish Speedfolk’ ! A new album from one of Germany’s, nay the WORLD’S foremost celtic-punk bands Fiddler’s Green hits the streets and to celebrate their 25th anniversary the band have handpicked fifteen (plus two new songs) of their best ever songs from their long career for release on this their first ever Compilation/Best Of album. Now first off an apology as Fiddler’s green have not been featured on this here blog that much. Don’t know why it’s just been that way and for a band their size and popularity we’re hoping to redress that right now. Fiddler’s Green formed way back in 1990 in the Bavarian town of Erlangen. A small town that is twinned with our very own Stoke. Their live shows are infamous and they have released a multitude of albums and singles over the years. It is that live act that has enabled them to perfect their sound and also their ability to transfer that sound successfully onto disc that has gained them such popularity. One of the problems with all celtic-punk bands is that it is primarily a thing to be enjoyed in the flesh as it were. In the boozer or the club with friends, new and old, and a beer or two in the hand as well. It’s hard to capture the passion and excitement of a celtic-punk gig on a studio album but when a band achieves it then that album surely becomes a must have and Fiddler’s Green have been doing exactly that for 25 years now!! Various members have come and gone, as they will do in a band that has been going for such a long time, but the core of the band has remained the same and they have never lost sight of the bands main principal. For their fans are everything to them. Another reason that Fiddler’s Green are so well loved by all and sundry. As for myself I don’t have a lot of their stuff so I thoroughly enjoyed this. With only ‘Wall Of Folk’ from 2011 sitting in my collection I had only heard a couple of songs from this album so I am loving it as if it was a brand new one. With that knowledge then I have to first say that I don’t know the albums or the years recorded the various songs are from though they are sequenced in a very good way and you can tell a lot of thought has gone into the placing of the songs on the album. The album starts with the first of the new songs, ‘Take Me Back’, and to say it is a blinder is a massive understatement. From the very off Fiddler’s Green show their power and intensity and superb musicianship. Followed by a great version of the Irish standard ‘Rocky Road To Dublin’ and then from their ‘Wall Of Folk’ album the great ‘Victor And The Demons’ a fantastic celtic-metal-punk song with great catchy chorus and brilliant drumming keeping time. As your flying through this review I have to draw your attention to Fiddler’s Greens amazing collection of videos. each and every one is worth repeated viewing so check out their YouTube page, address at the bottom of the review. Next up is ‘Yindy’ and has a gypsy feel to it with the accordion to the fore. ‘Old Dun Cow’ is more of the same and then the Fiddler’s Green anthem ‘Folks Not Dead’. Fast and furious this could be the anthem for the whole scene to be honest. ‘Long Gone’ slows it down and shows the Bhoys can do ballads as well as anyone before ‘We Dont Care’ shows another side to them with a catchy ska-tinged punky number. Taken from the ‘Winners And Boozers’ album of 2013 this shows how versatile Fiddler’s Green are and at their exciting best too. ‘Green And Fellows’ has them slowing it down again followed by a return to their own brand of ‘speedfolk’ with ‘A Night In Dublin’ telling of a tour round Ireland. ‘Never Hide’ and ‘Another Spring Song’ show again that the band can play celtic-punk without copying others or the songs sounding all the same. ‘The Night Pat Murphy Died’ is only the albums second cover and is again a fantastic version of this Newfoundland traditional song regarding the death of a man and the antics of his friends as they engage in a Irish wake. ‘A Bottle A Day’ is yer class drinking song while ‘Bugger Off’ is from 2009’s ‘Sports Day At Killaloe’ and speedfolk can barely describe how fast they can get. Wouldn’t want to be caught unawares on the dance floor when this comes on. You’d end losing both your pint and your shoes! I know I’m repeating myself here but the versatality of Fiddler’s Green is what amazes me the most about them. That ability to play fast, slow and inbetween without you even noticing the change in rhythm. The albums other new song ‘Burning The Night’ is a epic blast and though played slow the band play with such an intensity that it almost seems punked up to 11. That the albums two new songs are among the best shows Fiddlers Green have an awful lot more to come and even though it may leave you very poor its well worth checking out their extensive back catalogue. ‘Blarney Roses’ brings this fantastic album to an end and this Irish classic is a fitting end with the celtic instruments pushed right to the foreground. The tracks seventeen tracks come in at exactly one hour long so value for money is not an issue here. The question is would I recommend it to you. The answer is the same with all compilation albums. If you’re new to Fiddler’s Green then without question as soon as you finish reading this review go to your purse/wallet and get your card and order yourself a copy of ’25 Blarney Roses’. If you do like them then I suppose its a question of weighing up how much of the tracks you’ve already got and deciding for yourself. And finally if you are a massive fan then you will just get it for the brilliant two new songs I am sure… and believe me it’s a wise investment! Just recently we reviewed the debut album from Rovers Ahead , who are an amazing celtic-punk band from Denmark (see here). Well the reason we bring that up here is their lead singer is from Dublin and Keltikon, despite hailing from Zurich in Switzerland, also have a celtic singer in Iain Duncan. That a 2nd generation Scot should wash up in Switzerland should come as no surprise as people from the celtic nations spread out in further directions than just the usual routes of the America’s or Australia/New Zealand and bring with them the knowledge and know-how and, lets face it, a extra bit of authenticity to celtic-punk bands out there in Europe. Formed as late as March 2012 Keltikon have wasted no time in their short existence and their debut album hit the shelves in February of this year. 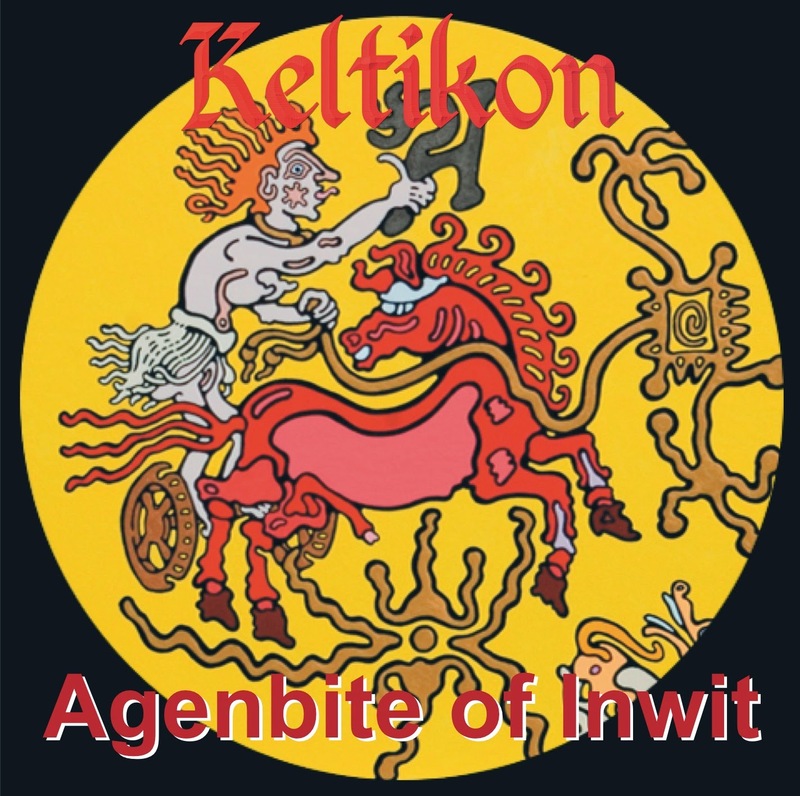 The title of the album ‘Agenbite Of Inwit’ is an old-English phrase meaning ‘Again, a bite of inner wit’ or, put into modern terms, a crisis of conscience or remorse. Taking traditional Scottish and Irish jigs and reels, celtic songs and ballads Keltikon spice them up with their own recipe of punk and rock to come up with something relatively unique to these ears! The song also has a jangly guitar feel to it reminding me of bands like The Wedding Present. They slow it right down for the following track with flute taking the lead on ‘Bonnie Ship The Diamond’, an old Scottish song popularized by Scots folk legends The Corries and more recently , the German celtic-punk band, Fiddlers Green. ‘Seven Ships’ comes next and has a real northern English folk feel to it. Traces of The Levellers too, at their best I hasten to add. ‘The Mariners Tale’ is a spoken word piece done in the style of old English TV programme Jackanory, telling the tale of a nuclear submarine called The Diving Dutchman. The story continues in the next track also called ‘The Diving Dutchman’ and steams along at a good old rate in the albums punkiest song. ‘Away To Fight’ is a beautifully slow acoustic ballad telling the tale of the WW2 invasion of Normandy beach in the words of a soldier about to disembark. ‘The Blackbird’ a traditional Irish reel whizzes past with the band not missing a beat and the pipes in truly outstanding form. That we have returned to feudal times is the theme of ‘Hold On Tight’ another slow acoustic ballad, the female backing vocals a nice touch. The fiddle is to the fore in ‘Each Others Dreams’ a rather poppy song that never really gets going in the way you’d expect it to leaving the epic ‘Taliesin’ to close the album. At nearly ten minutes long its pretty risky but completely works as all the band members get a chance to show what they can do and none come up short. Taliesin was a renowned Welsh bard who is believed to have sung at the courts of at least three Brythonic kings and lived during the 6th century. It has a bit of a prog-rock feel to it and comes in waves getting louder and louder building up to a crescendo and despite its length does not outstay its welcome. With ten tracks and clocking in at just under a hours worth of music it’s great value and even though the tracks are quite lengthy it never drags for a second. The various elements of celtic music are all represented so this album will appeal to anyone with even the slightest interest in celtic music.